Simple tips and tricks to unlock the best sleep of your life from the host of The Model Health Show podcastIs high-quality sleep the missing component to help you shed fat for good, stave off disease, and keep you productive? Shawn Stevenson, host of the popular podcast, The Model Health Show, is here to answer this and many other sleep-related questions. As a teenager, Stevenson was diagnosed with a degenerative bone disease, crushing his dream of becoming a professional athlete. Like many of us, he gave up on his health and his body, until he decided to fight back. Through years of research and consulting health experts, Stevenson discovered there is one criminally overlooked aspect of health: sleep.Through better sleep, Stevenson was able to achieve fitness and business goals he never thought possible, and now he shares those tips with the world. The book includes a 21-day plan with tips and tricks like the exact time of day to exercise for better sleep quality, what to wear to avoid waking up at night, and ways to fall asleep faster. Throughout, he weaves his personal journey to better health, helping readers along their own path to wellness. 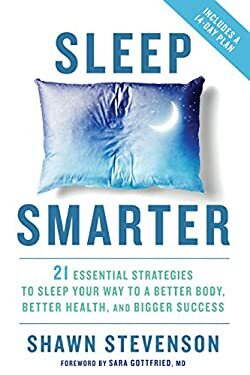 Sleep Smarter is the ultimate guide to sleeping better, feeling refreshed, and achieving a healthier, happier life.